Walnut 9 Drawer with great wooden pulls. Paul McCobb 3 Drawer Dresser. Baughman for Drexel 4 Drawer Dresser. Mel Smilow 3 Drawer Walnut Dresser. 2 available. Janus Collection Walnut 4 Drawer Dressers-pair. Glenn of California Walnut 3 drawer dresser. Carlo DeCarli 6 drawer chest. Paul McCobb 4 drawer Calvin Group. Paul McCobb Narrow 3 drawer chest. Edmund Spence walnut dresser. Made in Mexico. William Hinn 4 Drawer Dresser. New white marble top. Made in Sweden. Tommi Parzinger for Charak Modern Dresser w/ marble top. 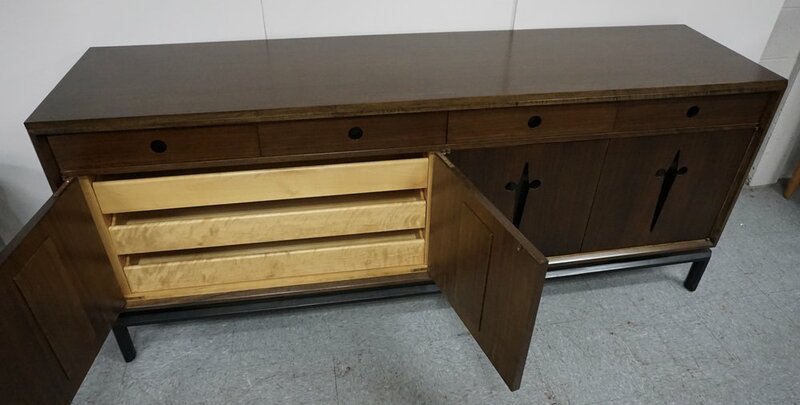 Unusual Paul Mccobb 6 drawer with early wood handles. Martinsville walnut 3 drawer chest.